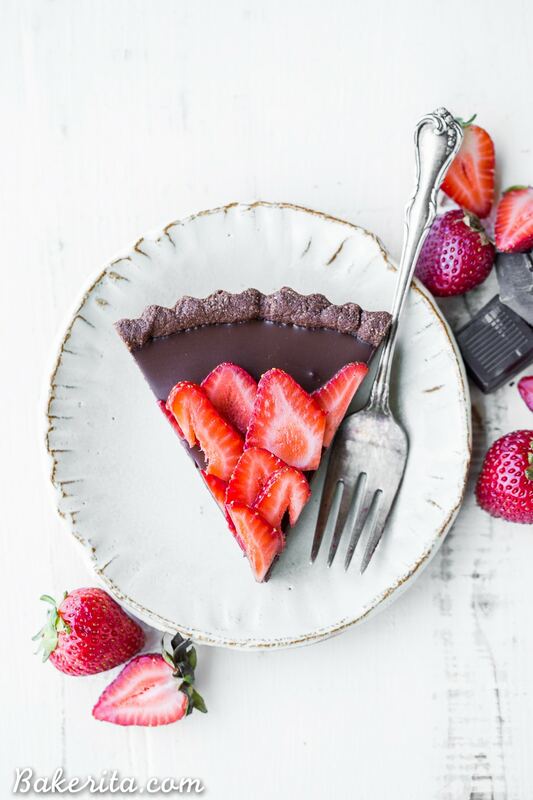 This Strawberry Chocolate Tart is filled with vegan chocolate ganache and topped with fresh strawberries, all in a chocolate crust. Slice into this easy and delicious gluten-free, Paleo, and vegan dessert. **2018 Update** This post was originally published on March 28th, 2016. I thought it deserved a little update, so I reshot the photos and made a couple small changes to the recipe to make it simpler, more delicious, and much more luscious. 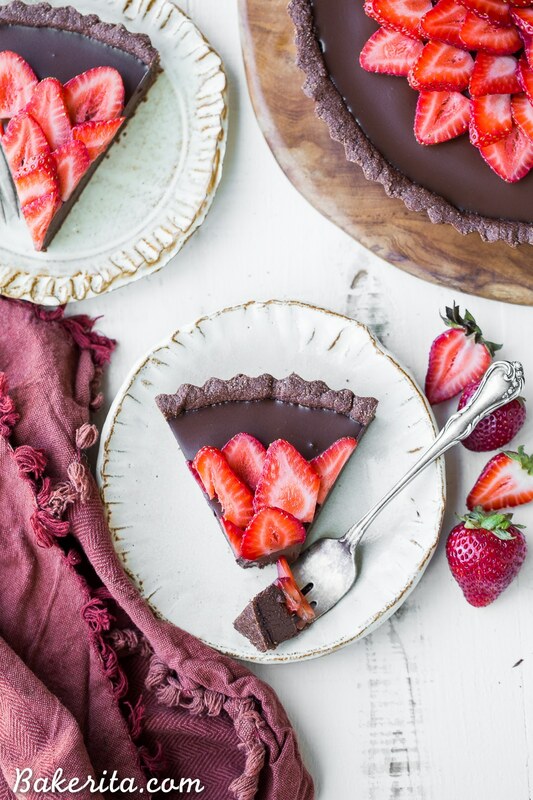 This Strawberry Chocolate Tart is rich, with an epic chocolate ganache filling, all tucked into a simple chocolate crust. It’s easy to make, but impressive enough to serve to company. Oh, Monday. Mondays after a holiday are always worse than the usual Monday, don’t you think? I spent the past week in Costa Rica with my whole mom’s side of the family, soaking in plenty of sun on the beach and chasing around monkeys and iguanas. We had an incredible time, traveling first to Rio Perdido – an eco-friendly resort with the most incredible thermal river. The river (the resort’s namesake) is one of the few thermal rivers in the world and was among the most incredible things I’ve ever experienced. My sister, aunt, mom and I spent hours lounging in the 95-degree water, sitting with our backs against the rapids and letting nature give us a warm massage. We went zip lining through canyons, tubing down a river, and spent lots of time admiring the monkeys jumping around the trees right outside our hotel room. We then headed to the coast to Playa Conchal to meet up with the rest of my mom’s side of the family and spent our days in the sweltering sun, relaxing, and eating our weight in the most delicious pineapple, mango, papaya, and watermelon. We went snorkeling one day, made two day trips to Tamarindo to explore the town, and ventured to the top of a hill via dirt road for massages and beautiful ocean views. I was posting on Snapchat throughout the whole vacation, so hopefully, you were able to follow along! It was a magical week, but after a long 8-day vacation, followed by an Easter full of traveling, I’m ready to spend Monday curled up in bed. I’m jet-lagged, waterlogged, and a little sunburned, but totally relaxed and ready to get back to work – after a nap, that is. Thankfully, if anything can get me excited today, it’s some chocolate and strawberries. I’ve always been obsessed with the combo (because it’s one of the best EVER, IMHO) but recently, I’ve been all about chocolate strawberry e-v-e-r-y-t-h-i-n-g lately. These chocolate strawberry brownies ignited the recent obsession, and I made it acceptable for breakfast with this scrumptious and filling chocolate strawberry oatmeal. 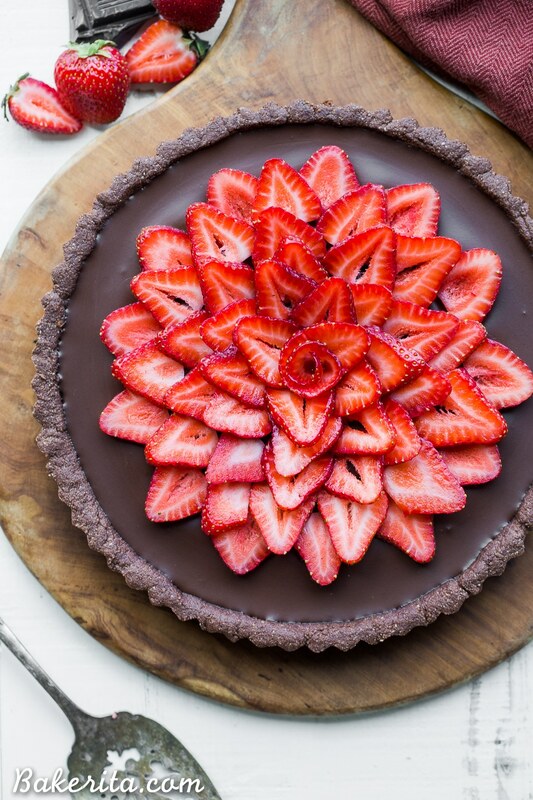 And now, we’re heading back to dessert territory with a strawberry chocolate tart! Tarts are one of my favorite things to make – they’re simpler and faster to make than pies (no rolling out crust!) and always look so darn pretty, especially when fresh fruit is the star. 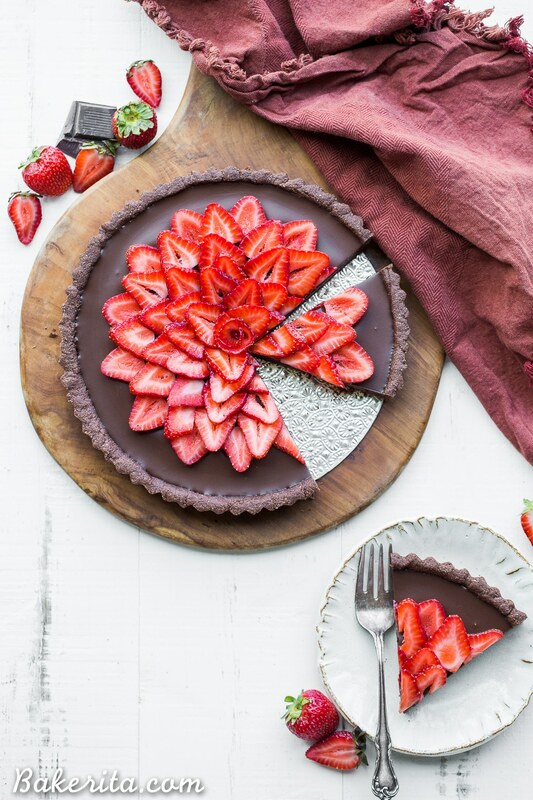 This strawberry chocolate tart checks both those boxes, and has the added bonus of lots of chocolate! We start with a chocolate crust, and then pile in some vegan chocolate ganache and top it off with some maple syrup-brushed strawberries. The whole thing is gluten-free, grain-free, and vegan! Three cheers for that. The chocolate ganache is smooth and rich, while the strawberries provide the much-needed burst of fruity flavor to cut through the chocolate. If your strawberries are super sweet on their own, you can skip the maple syrup. I loved this tart, and I hope you will too! Enjoy. This Strawberry Chocolate Tart is filled with vegan chocolate ganache and topped with fresh strawberries, all piled in a chocolate crust. Slice into this easy and delicious gluten-free, Paleo, and vegan dessert. Preheat oven to 350ºF. In a medium-sized mixing bowl, combine the almond flour, cacao powder, and salt. Stir in the melted coconut oil and maple syrup and mix until fully combined. Bake in center of oven until golden and firm, about 12-15 minutes. Transfer to a wire rack to cool completely. Place the dark chocolate in a bowl. Microwave the canned coconut milk for about 1 to 1 1/2 minutes or until steaming (you can also do this over the stove). Pour the hot coconut milk over the chocolate and let stand for a few minutes. Stir until fully melted and combined. Pour into the cooled crust and transfer to the refrigerator to cool completely, about 1 hour. In a separate bowl, combine the strawberries and maple syrup. Let macerate. Top with the strawberries, arranging however you desire. Serve immediately. This tart can also be made a a day or two ahead of time. If you’re planning on making it more than a few hours before needed, wait to add the berries until just before serving. For the dark chocolate, I like to use Santa Barbara Chocolate's Coconut Sugar Sweetened Chocolate. It's both paleo and vegan! You can use the code BAKERITA for $10 off. If you want it darker, you can add some unsweetened chocolate too. « My EverlyWell Food Sensitivity Test Results + Experience! Sounds like you had such a fun vacation, Rachel! This strawberry tart looks like the perfect treat to share after your trip. Love this gorgeous deliciousness going on here. I think I would devour this ALL myself! That trip sounds fantastic and I love the thought of seeing jumping monkeys from your window! Chocolate and strawberry is one of my favorite combos. I love the creativity of this vegan tart! This looks stunning Rachel! I am all about strawberries right now and this is such a perfect way to use them up! Pinning! The tart looks delicious. I have one question. The ingredient list states 1/2 cup unsweetened coconut and om the directions it refers to coconut sugar. Which is correct? I have both and am dying to try this recipe. Thanks. Hi Debbie. That’s what happens when I proofread at 1:45am – haha! The recipe is updated. It’s unsweetened coconut. Enjoy! This tart is stunning! I am so excited to get home so I can start to incorporate all those spring strawberries into EVERYTHING :) Pinning! Your trip sounds amazing!! Sometimes do you need another holiday to recover from your holiday. Nap away!! This tart looks so tasty! Michael loves anything/everything strawberry+chocolate and I know he’d ADORE this tart! You can never go wrong with strawberries and chocolate! So so beautiful!! This tart would be perfect to serve/ bring to a party or gathering! Costa Rica sounded wonderful, Rachel — definitely the trip of a lifetime! This tart looks wonderful, too — strawberries and chocolate are one of the best combinations, and I love that this is healthier! Sounds like a wonderful vacation Rachel! But I understand needing a vacation from your vacation, lol, at least one day to just veg out and get back into the flow. 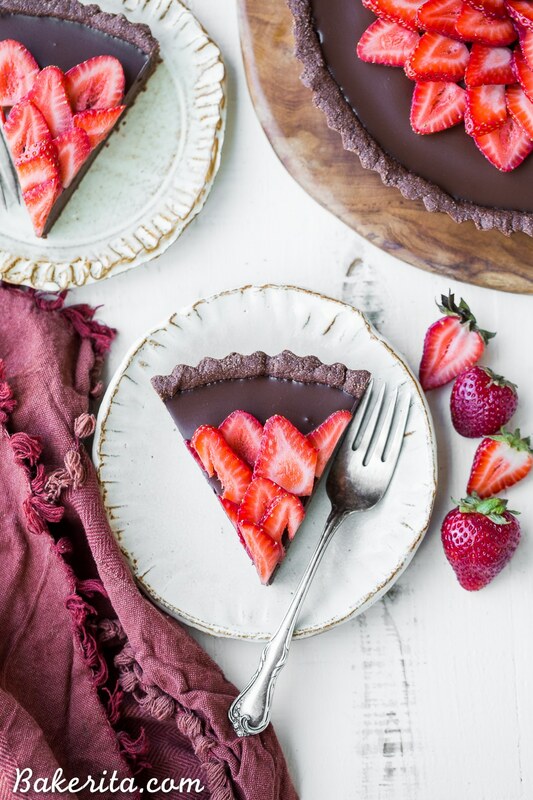 This Strawberry Chocolate Tart is perfect motivation, strawberries and chocolate is always a winning combo and ganache is one of my all time favorites! Take care. Haha it gets tiring!! Thanks so much, Stacey. Daaang Rachel.. so much here. First, your trip! I’d love to hear about your snorkel adventure, what you saw and more about the birds. What an amazing adventure and experience. The thermal river.. I had no idea. Nature is so incredible. Do you still have your head in vacation fog? It usually takes me at least a week to get going again! ha! Two, this tart! That ganache is heaven (you wont believe what I’m posting tomorrow! )… I mean, lick the bowl, eat nothing else heaven! What a great idea too.. Absolutely gorgeous and perfect for berry season! Thank you for this, Rachel! Ganache is seriously the best, and yes I’m totally still in vacation fog, haha. And I’m really missing the breakfast buffet piled with freshly cut tropical fruits! The thermal river was UNREAL – one of the cooler things I’ve ever experience in nature. I wish we had seen more while snorkeling, but we saw lots of fishies, a sting ray (!!) and a turtle! Thank you so much Traci! Your vacation sounds like it was incredible!! And this tart! I was just thinking the other day about how it’s been so long since I’ve made ganache (issues with heavy cream) – I so need to make this! I’m loving all the strawberry and chocolate dessert recipes that you have been posting so keep them coming. Will a cheesecake pan suffice? As long as it’s similar size, it should be fine. Enjoy! Made this as my first ever vegan dessert and my vegan guests were definitely impressed! I did have to triple the quantities as I used a 10″ pan to spread a 1cm crust… and same, adjusted the filling to a satisfactory ratio. How thick is the base in your recipe? Glad to hear you enjoyed the tart, Aaron! I’d say the crust when I made it was a bit thicker than traditional pie crust. Thanks for your feedback! I do not care for coconut. Can I substitute something for the coconut cream? I guess I can try and tolerate the coconut in the crust or do you have a substitution for that also. I am so excited to make this for a girls night! Hi Peg, you could use about 3/4-1 cup of almond milk instead of the coconut cream. For the crust, you can sub the shredded coconut with more almond flour and use refined coconut oil so you don’t get any coconut flavor. Hope you enjoy it! This looks delish! Would love to try this weekend. Could I make the crust and ganache in advance and assemble before serving or would it be ok to assemble and sit for a day? Thanks! 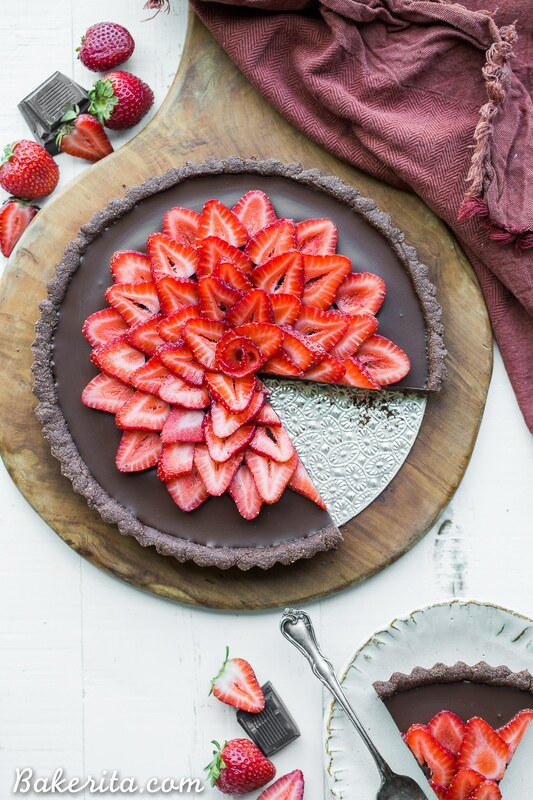 This strawberry chocolate tart is so Instagrammable and adorable! I finally got to make this dessert this past weekend and it was such a hit!! Thx for sharing! 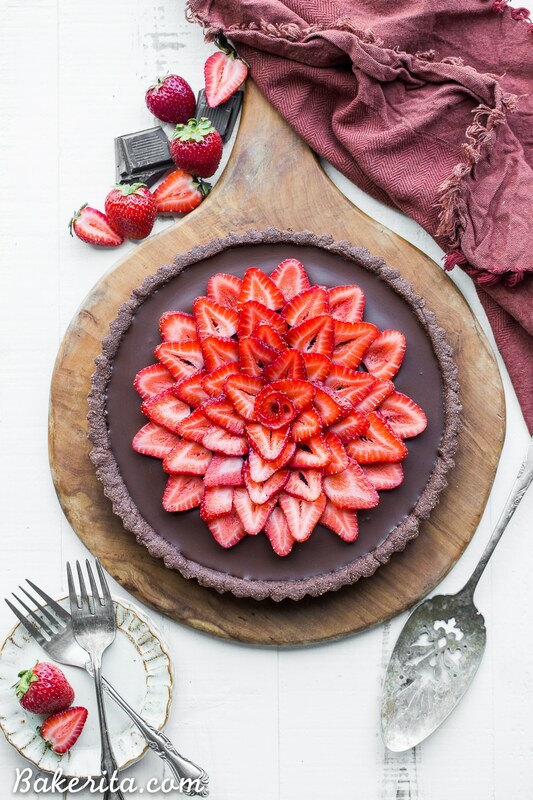 Absolutely love your creative idea with strawberry chocolate tart! Never seen something like this! Definitely I will try to make them too! Thx for sharing Rachel! Well after 10 minutes of whipping the chocolate (so NOT VEGAN) and coconut cream I gave up and went to credible source to make another VEGAN strawberry cacao flan. Ripped off! Hi Sandy, actually dark chocolate is inherently vegan as long as you’re using one that is good quality – it’s only crappy brands that add milk products to their dark chocolate. True dark chocolate is just cacao butter, cacao powder, and a sweetener of some sort. Not sure where you went wrong since you didn’t tell me what happened.